A consular post was first established in Rabat in 1826 and successive incumbents lived rent-free in a house that was granted to them by the sultan on the edge of the Medina and close to the river. It was a two-storey Arab house with an open court at its centre and with the living and office rooms on the first floor. When Rabat became the capital of Morocco in 1912, this vice-consulate building had to serve as the consulate-general until something larger could be found. Its freehold was acquired in 1921. In 1926, a site that the French had confiscated, was bought (and slightly extended in 1929) for a new consulate-general at the corner of Rue de Nancy and Rue Guynemer. Although various sketch designs were proposed for it over the next five years, momentum never built up for its development. This was mainly because Sir Andrew Ryan, a former chief dragoman at Constantinople, was content to continue roughing it in the old Arab house, once the offices had been removed to leased premises in the Rue de Bordeaux. Not so his successor, WS Edmonds, who arrived in 1930 and quickly procured a medical certificate condemning the old house. He took a five-year lease on a decent house near the edge of the town instead. This move enabled the original Arab house to be sold to the Pasha of Rabat, on behalf of the Moslem Charitable Society, in 1932. And the undeveloped Rue de Nancy site, no longer suitable because a large and noisy lycée had been built next door, was sold in 1934. In January 1933 Edmonds reported that ‘I have found an architect who is willing to build a house to my requirements’. 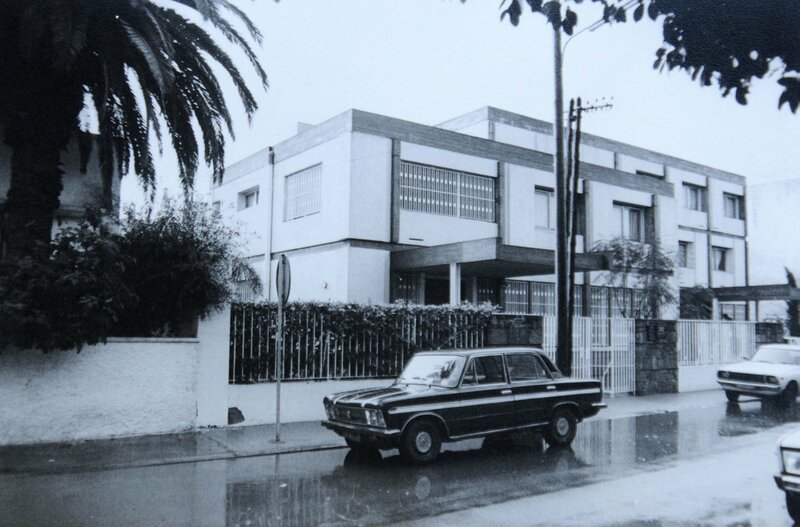 Mr Leonard Barber, a leading British merchant of Casablanca, owned a suitable 2,300 square metres site on Boulevard Bou Regreg and was prepared to employ M Lièvre, a leading local architect, to build a house according to the consulate’s requirements in return for a reasonably long lease being taken on it by the British government. The instinct of the Office of Works was to disapprove of the idea but they were won round by the reasonableness of Barber and the co-operation of Lièvre. The house was completed and occupied in 1938, and seems to have been a success from the outset. 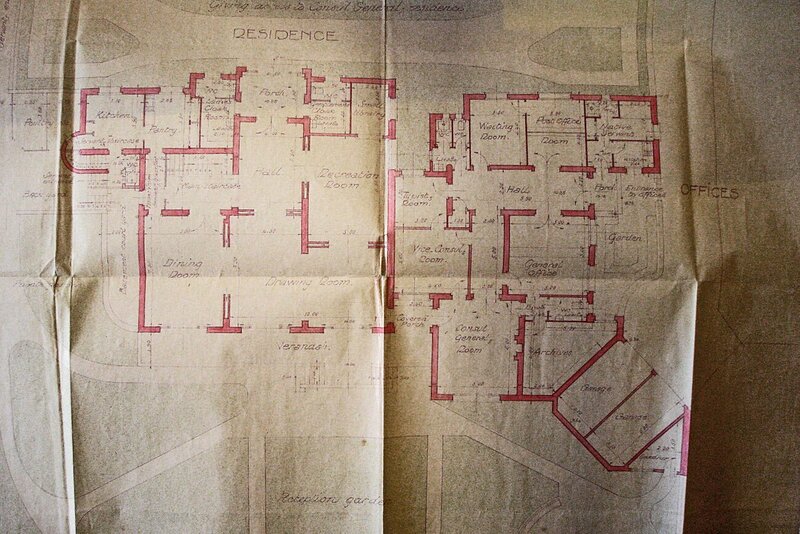 It comprised residence reception rooms and consular offices intelligently differentiated on the ground floor, with bedrooms above part of it. Leases were several times renewed, and at some juncture after WWII the offices moved out, until in 1973 the Property Services Agency bought the house for £70,000. By then it was referred to as Britannia and Bellevue at 35 Boulevard Bou Regreg. 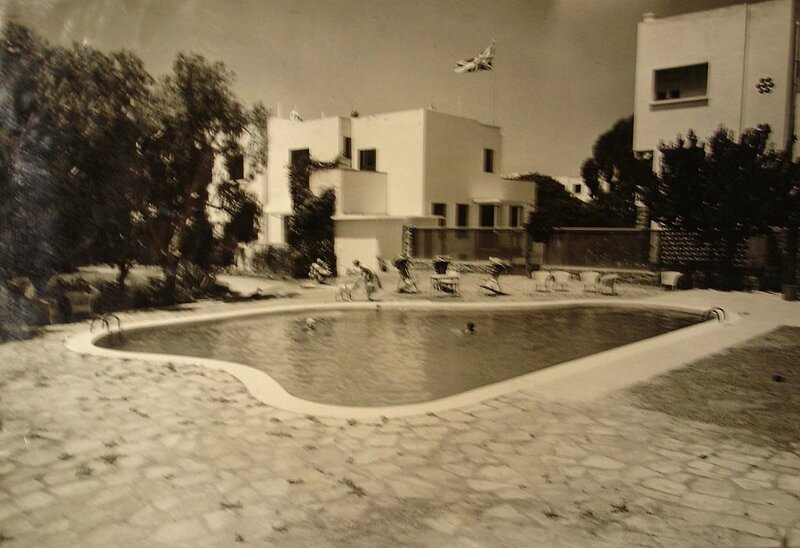 In the same year, the PSA bought the next door Villa Monto for £16,000 as another staff house and to enlarge the residence garden. Although a replacement has been considered from time to time, the main building remains the residence. By 1965, the offices were leased on the 4th and 5th floors at 28 Avenue Allal Ben Abdullah. They moved in 1978 to a block, just completed to an in-house design, at 17 Boulevard de la Tour Hassan. The landlord, who was the Political Director of the Moroccan Ministry of Foreign Affairs, declined all offers to purchase the premises. This building was adapted in 1990 to cope with the additional work arising from the introduction of a new visa regime. But by the turn of the century these offices were no longer sufficiently secure, and were too small to cope with the projected move of visa work from Casablanca to Rabat. A site at Souissi, 28 Avenue S.A.R. Sidi Mohamed, was bought in 2001, and a limited design competition held for the new embassy, which was started on site in 2004 and occupied in July 2006, at a total cost of about £9 million. 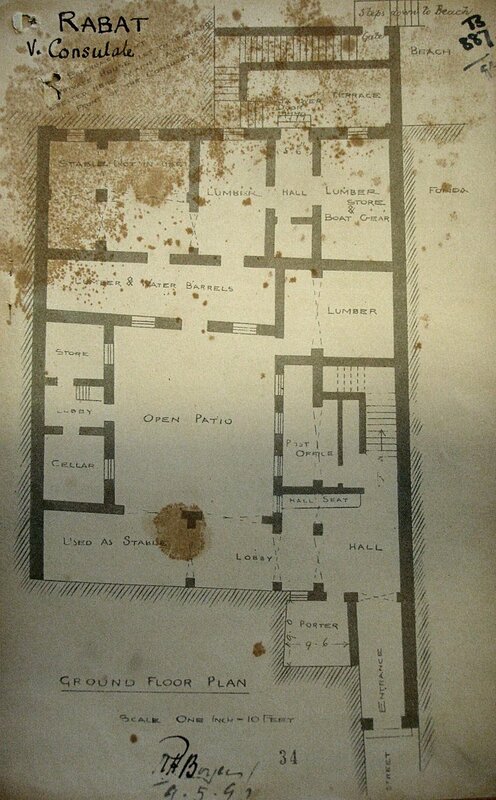 Ground floor plan of first consulate house, 1890s. 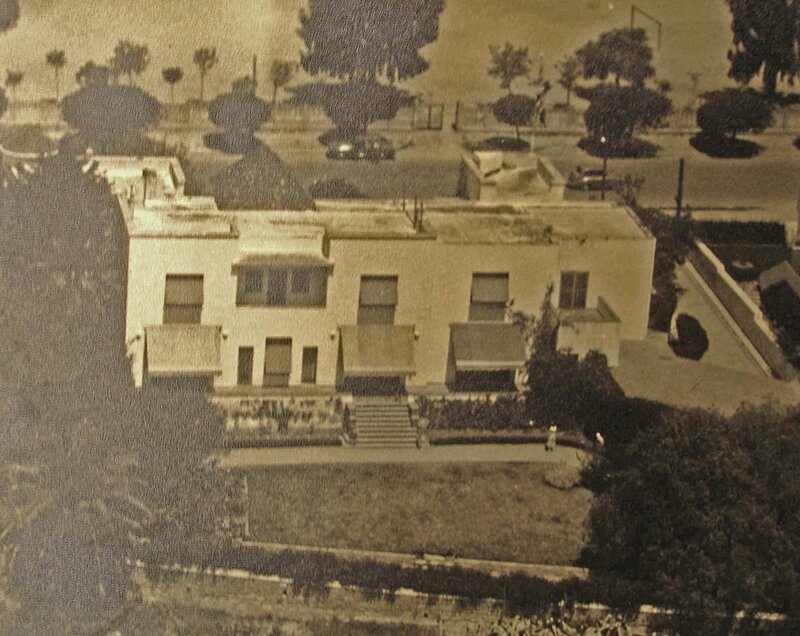 Aerial view of consular house, viewed from garden side, 1958. Residence garden, now enlarged, ?1970s. New offices on ? Boulevard de la Tour Hassan, late 1970s. 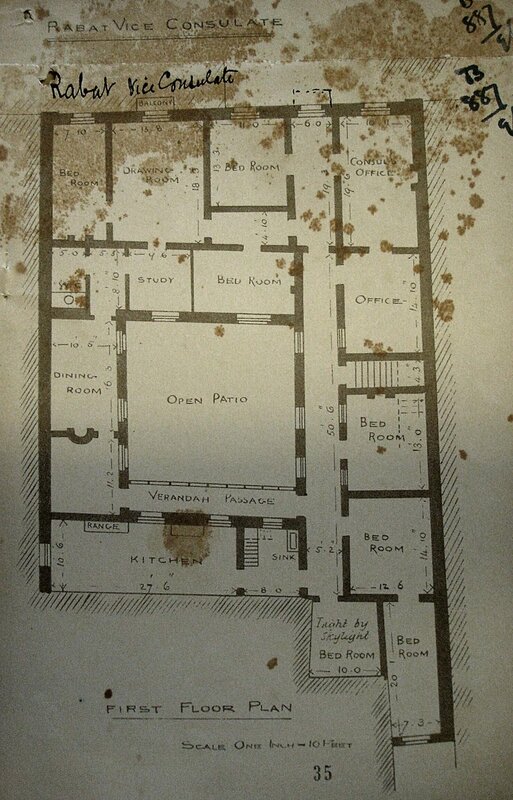 Ground floor plan of proposed new consular house: residence on the left, offices on the right, 1937.